How Long Will Google Wave Friend Invites Take? 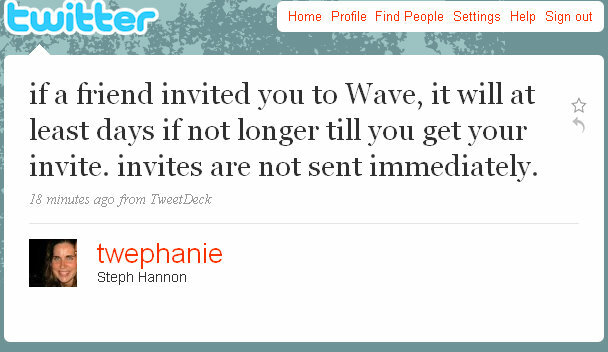 Steph Hannon, a Google Wave Engineer, just tweeted about friend invites from people who already have Google Wave. So if you are lucky enough to have a friend who sent you an invite, you’ll have to wait just a little bit longer to get the official invite from Google! Is all of the “waiting”, and “supply / demand” effect with Google Wave a marketing strategy from Google or what?